Why did Awareity create the Vault? We saw organizations wasting countless hours and resources printing handbooks, making updates to policies, sending out revisions, tracking down employees to have them sign off that they read the new policy, keeping track of who has seen and who has not seen what on spreadsheets, etc. all in the name of accountability. Not to mention the hours spent in face to face meetings and training sessions, but how is that really being accountable? Awareity decided automating these status quo efforts would both save time and provide a more seamless and efficient method for ensuring all individuals are aware of their roles and responsibilities in order to keep the organization’s people, data, and information safe. Sound too good to be true? Trust us, it isn’t! Let us show you, request information now! 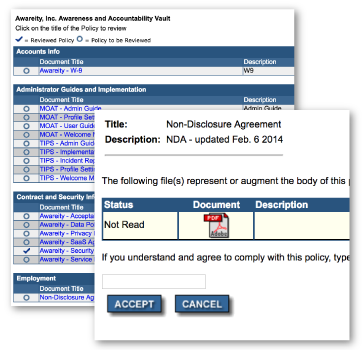 The Awareness and Accountability Vault (AAV) is a set of web-based tools within Awareity’s Community-wide Fusion Platform designed to improve the ongoing awareness of organizational policies, procedures, trainings, best practices, etc. – really any information you need your employees to be aware of – and you need to be able to show they read. Why is the Vault needed? Because no one remembers everything they learned on that one day of annual training, the Vault provides a critically needed tool for the other 364 days after annual training day so you can address what everyone knows (including hackers, terrorists, and insiders) is the weakest link – employees and third-party service providers who lack updated and situational awareness in order to improve the safety of your people and organization. Awareity has several free training modules that can be uploaded into your Vault and customized to fit your organization’s needs. Contact us today to learn how to gain access to these award-winning Information Security Awareness Training, FERPA, HIPAA, and PCI-DSS training modules.